Before we start a project, we need to meet and see if we gel. Discuss your requirements and iron out any grey areas. As well as building websites ourselves, we also work in partnership with other website developers. Delivering projects which combine more complex functionality with our distinctive creative designs. What can Dizzy offer to website developers? Wordpress is a popular content management system. We choose to use WordPress to build many of our websites. It’s a great option for businesses with a modest budget that want creative, original design and the ability to add and update content themselves. Finding the right e-commerce solution at the right price can be a challenge. Dizzy will help you make the right decision. At Dizzy we can design and develop logos for small to medium sizes companies, with supporting stationery, literature and website to complete your identity. Consistency can be difficult to achieve if you are using different companies to create your website and print materials. Dizzy can offer both these services under on roof, assuring consistent thought and production throughout. 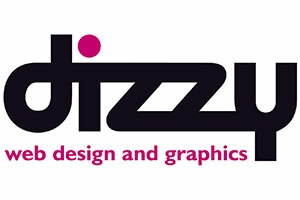 At Dizzy we can also take care of your printed artwork and design requirements. This ranges from a simple advert or leaflet to large brochure or catalogue. We have many years of experience in creating artwork to templates using the latest Adobe software and supplying print ready PDFs. Whether you require graphics for front of house or you are going to be exhibiting, from a single roller banner to full system graphics. Dizzy can supply artwork to suit your needs. At Dizzy we have experience in creating large format graphics for systems such as Nimlock as well as graphics for exterior of shops and large advertising banners for Rugby and Football clubs. You are looking for creative web or graphic design, you want to use a local company based in the Newbury or Berkshire area and you need a professional service at an affordable price. You have come to the right place. Dizzy Web Design and Graphics based in Newbury Berkshire, offers creative, professional web and graphic design services at affordable prices. We provide both the graphic design and web design service, so our designs flow seamlessly across all media keeping your corporate identity and your brand intact. Whether you need a full content managed website, just some new business cards or something between the two, Dizzy can help. We build websites in-house using WordPress software. For the more complex sites we work with our partners to offer you all the functionality you might need. Our customers come back to us because we offer great quality at affordable prices.